Have you ever thought a great way to help make the mortgage payments on your vacation home would be to rent it out? There are numerous services available that can help vacation home owners with the variety of decisions that go into renting vacation property. Kim Rubey, director of communications at Airbnb, was quoted in an article for foxbusiness.com saying that more people are turning to renting to avoid foreclosure, help finance college, or even pay for an amazing honeymoon or vacation. In fact, according to the National Association of Realtors, 27% of vacation home buyers plan to rent out their property. What’s the Best Way to Rent Your Vacation Home? Here are several basic considerations you need to determine before you put out the “For Rent” sign. Property Management: How are you going to manage the individual rentals? You can hire a full-service management company, but be prepared to lose 20% or more of the rental income in fees. If you handle the booking and marketing on your own, be prepared to devote a lot of time to the endeavor. 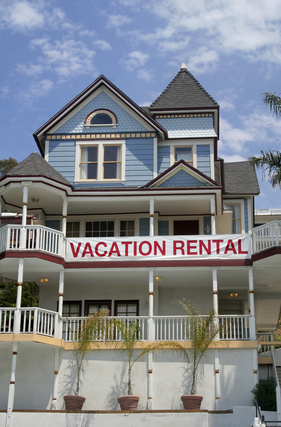 One way to minimize the hands-on management of individual rentals is with vacation rental management software. John Amato, President of Bookerville.com, a specialty developer of vacation management software, suggests home owners look for software that has an online booking calendar that updates in real time, built in email templates to automate communication with renters, the ability to set minimum stay nights, and a system that will easily integrate with your current website and payment system. Web Presence: With the popularity of social media and ratings sites, you’re going to want an online presence with professional looking images. Make sure your photography is well lit and accurately shows your property. Your description of the property needs to make it stand out from other rentals in the area. Highlight features and amenities, including what you do as a home owner to make sure a client’s stay is wonderful. You also need to keep the description and images up to date. Insurance: The last thing you want is to rent your home to one unsavory person and find thousands of dollars in damage when they leave. Renters insurance specifically for the vacation rental market is peace of mind that you’re not going to make one mistake that you’ll pay dearly for. Property Marketing: You can have the most gorgeous property in the neighborhood, but if nobody knows about it, you’re not going to get very far with your rental plans. Using the right website to list your property is vital for success. Here are a list of several of the industry’s leading sites: FlipKey, Airbnb, HomeAway, and VRBO. Renting out your vacation home can be a lucrative endeavor, when it’s thought out and well-researched. Take your time, investigate your options, protect your investment, and talk to other property owners that have been successful in renting their homes.